Tunisia, located in North Africa between Algeria and Libya, boasts a rich and colorful history and culture. It was once part of the Carthaginian Empire, whose capital city, Carthage, built in 814 BC, was believed to be located a little to the NE of modern day Tunis. The majoritiy of Tunisians are of Berber descent and consider themselves Arab. The dominant language is Tunisian Arabic although French, English, and Djerbi are also spoken in areas. 149 -146 BCE: during the Punic Wars Cathage was destroyed by the Romans who then assumed control. By the 5th Century CE, the Vandals has wrested control. 534 CE: the Vandals are defeated by the Romans and Africa returns to the Roman Empire. 7th Century CE: Arab invaders take control of the area and Romano-Christian culture was replaced by Islam. 1574 CE: Tunisia become part of the Ottoman Empire. 1881 CE: France signs the Bardo Treaty making Tunisia a French Protectorate. Sept. 1954 CE: an all-Tunisian government is established. March 1956 CE: the Bardo Treaty is invalidated making Tunisia a sovereign state. Tunisian dance is as unique as the costume. Dancers typically wear a volumninous gown which covers the majority of her body and is fastened at the shoulders with pins connected by decorative chains and beaded cords. An under-tunic with long sleeves is worn underneath, generally in a contrasting color to the gown. At her hips is tied a large yarn belt with long, flowing tassels. When dancing, the dancer uses sharp hip twists to accentuate beats in the music. Her hip movements cause the tassels to fly, making her movements all the more impressive. The hollow anklets of the dancer rattle together to the beat as well. Tunisian dance uses very little upper body movement and the arms are allowed to move naturally. 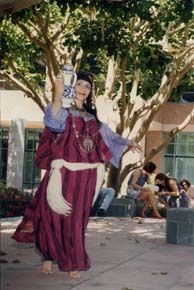 Commonly dancers will balance or cary jugs, or two-handled urns as they dance, though they seldom balance these of their heads as seen in other North African dances.